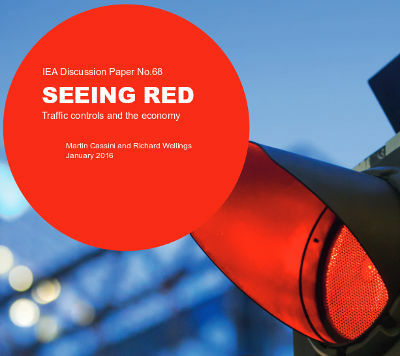 In a new report, authors Martin Cassini and Richard Wellings of the UK Institute of Economic Affairs demonstrate what they say are the negative social and economic effects of the government’s traffic management strategy. A huge proliferation in traffic regulations over the past twenty years has imposed a heavy burden on the economy. Just a two-minute delay to every car journey equates to a loss of approximately £16 billion every year, equivalent to almost 1% of GDP. The number of traffic lights in England has increased by 25% since 2000. By comparison, vehicle traffic rose by 5%, and the length of the road network by just 1.3% in the same period. Britain’s first speed camera was installed in 1992. By 2012 there were estimated to be over 3,000 camera housings at 2,300 fixed sites. Not only is a majority of traffic regulation damaging to the economy, it also has a detrimental effect on road safety and the environment, whilst imposing huge costs on road-users and taxpayers across the UK. The estimation is that approximately 80% of traffic lights could be ripped out in the UK. Cassini and Wellings make a case for an alternative approach which they say deliver many of the desired objectives, such as road safety, without the costs. They say shared space removes conventional traffic infrastructure, such as traffic lights, road markings and bollards. The report says evidence demonstrates that when regulations are removed, including the rules that give some vehicles priority over others, drivers behave with more consideration to other road users, improving safety and allowing traffic to flow more smoothly.